Well, here we are again with the same vintage quilt that I found at a thrift store…this time with Project #2! To refresh your memory, I found these country quilts at a Habitat ReStore in the North Georgia Mountains. I ended up just purchasing one of them…the pretty lady on the left! Back in April, I decided to use a less-tattered section of the quilt in my salvaged window frame to create some rustic wall decor for our Spring mantel. I love how it turned out, but better yet, I still have a few decent sections of quilt to work with! For Project #2, I decided to try my hand at creating a large kitchen hot pad / potholder / trivet to use underneath a baking dish (mostly my 2 quart baking dish). In my early Sadie days, I actually created a super simple trivet from my wine cork collection– and I still use it for smaller sauce pans and soup pots. But I was definitely lacking the right potholder for my favorite baking dish – and the quilt was the perfect project catalyst! This post contains affiliate links for your crafting convenience. First things first, I needed to figure out a good size for my kitchen hot pad, using my 2 quart baking dish to measure it (approximately). 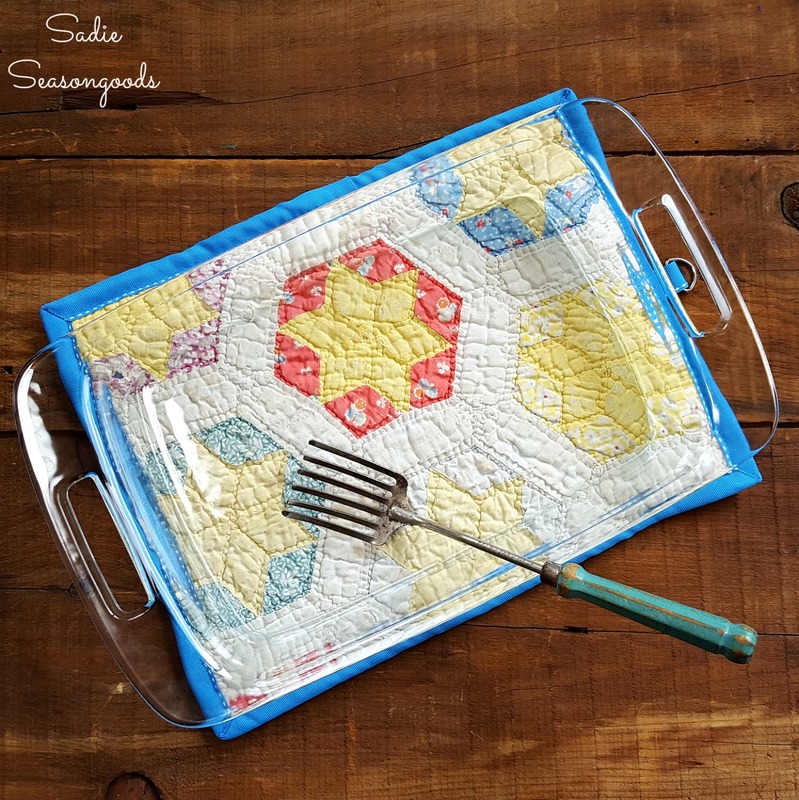 The secret to a making your own potholder / kitchen hot pad / trivet is something magical called Insul-Bright. I’m acting like I knew for a while but in reality, I just discovered it with this project in mind! You can guess the purpose it serves from its name, right? The “meat” of a hot pad or oven mitt. To create my kitchen hot pad, I sandwiched a rectangle of Insul-Bright between my quilt piece (top layer) and some plain backing fabric (from the remnants bin). And in the spirit of all things quilting, I decided to “stitch” my layers together with Basting Spray. To keep all things safe and clean, I covered my outdoor porch table with plain newsprint (i.e., packing paper), and sprayed each layer individually before layering them on top of each other. Because I had raw edges along the entire perimeter of my potholder made from country quilts, I needed to cover them somehow. Traditional bias tape would have been ideal, but because of the layered thickness, I decided to just wrap wide grosgrain ribbon around it. I also loved that this particular bright blue ribbon with contrasting white stitching was almost an exact replica of the entire backing of the original quilt. Such perfect ribbon for this project! I gave my sewing machine (which, by the way, is the perfect sewing machine for beginners) a fun workout with this potholder project (re: thickness) but it handled it like a pro. I even got to try my hand at mitered corners with the grosgrain ribbon – which turned out ok. It looks like a doll bed quilt! Isn’t my large kitchen hot pad cute? It looks like a miniature version of the original quilt! One last step- I want to hang it from the inside of the same kitchen cabinet where my baking dishes live, so I stitched a piece of the same ribbon (pressed in half, width wise, with a scorching hot iron), and a simple D-ring to the back of my potholder made from country quilts. And there it is! My perfectly adorable, can’t-wait-to-make-enchiladas-now-so-I-can-use-it potholder or kitchen hot pad made from country quilts! And it is the perfect size for my baking dish – hurray, hurray! Ta-da! It really worked out brilliantly. 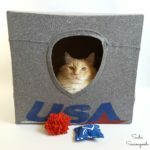 Interested in more repurposed / upcycled sewing & stitching craft projects? Check out my full collection here for even more inspiration before you go! Another fantastic idea! You were so smart to match the hotpad to your favorite dish. Happy Thoughts of Home. You rock! This turned out REALLY cute. Great job! Where did you get the amazing fork? At Landrum Eclectics- one of my all time favorite antiques stores! I love this idea. When I read hot pad I was thinking heating pad. You know, you could use this idea to also make a heating pad cover as those covers they come with do not stay on well and are too thin. Hmmm…. You are very right- it might work for that, too!! This is a wonderful idea! Thanks for sharing at Snickerdoodle Sunday! Great idea and use for a vintage quilt. 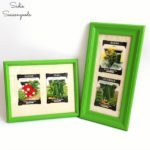 Thank you for sharing your project and wonderful tutorial at Vintage Charm. What a great idea! I’ll take a set, please, lol! Thanks for linking up to us on Throwback Thursday! Beautiful, I love what you have done with this quilt. Great ideas!! Basting spray, who knew? Certainly not me and I may never quilt anything but this might come in handy. Love what you’ve done with the quilt and love that you keep sharing all these wonderful projects with us at Celebrate Your Story. Right?? It was new to me, too, but it worked perfectly! Great idea, so useful and pretty!! What a great idea! I see these old tattered quilts for sale all the time and had never thought of this. I am thinking this might be a great idea for placemats, too! I had no idea about that insul – stuff! This would be perfect! Thanks so much for sharing over at the Celebrate Your Story! link party! I love vintage quilts, and this is a brilliant idea — love it! Thanks for sharing at Merry Monday! This is a wonderful idea! I hate to see quilts go to the trash because they take so much time and love to make. And now I really want a large hot pad for my casserole dishes. Pinning! Saw your feature at Cozy Little House, congrats! This is a great idea and I love patchwork. What a great idea for a worn out quilt! Thanks for sharing on the Pleasures of the NW’s DIY party! Love this idea, just another time I wish I knew how to sew. Thanks for sharing at the Family Joy Link Party! This is a beautiful way to repurpose something that may not be usable as is! Thanks for sharing at the Family Joy linkup! Love both the hot pad and window. I’ve got both a widoow and quilt here at home and need to put this together. What a wonderful way to salvage a lovely old girl! I can’t wait to see project #3. Any TINY scraps would make great fry pan handle pot holders; just a tad narrower than a simple eyeglass case!